It is our belief that the tremendous capabilities of technology can be integrated into all subject areas of the curriculum in order to deliver instruction effectively and productively. 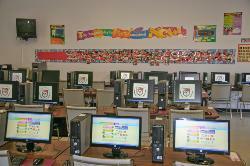 The Technology Curriculum prepares students to use computer technology for schoolwork and personal use, for accessing and applying information, for problem solving, and for communicating ideas and data. The curriculum also includes objectives for students to understand the societal uses and importance of technology, and exhibit ethical behavior in using technology. All students attend the computer lab. Kindergarten through Third Grade classes usually visit the lab twice a week where they engage in a variety of language arts activities to expand vocabulary, content comprehension, and character development. Students in grades Four through Eight work in the computer lab at least once each week where they create, publish and present projects related to classroom curriculum. Students conduct well-monitored online research while concentrating on recognizing the information’s validity and learning about the dangers of the Internet and how to stay safe online.